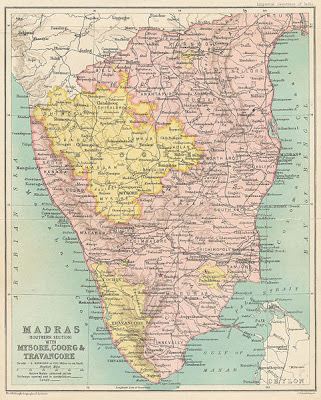 A 1909 map of Southern India, showing, Madras, Mysore, Coorg, and Travancore, as separate territories. Coorg State was a separate State within Union of India from 1950 to 1956 with Mercara as it's Capital. Coorg was earlier a small independent kingdom till 1834, which was annexed by British, as a result of Coorg War and the King of Coorg was deposed. Coorg as such in 1834 became a separate province of British India. Upon independence of India, as a legacy, it became a province of Union of India. A map of Republic of India in year 1950, showing boundaries of Coorg State. Coorg State was formed out of the territory of former Coorg Province, which became a part and parcel of Union of India on 15th August, 1947. Coorg worked as a Province, till it was created as a Class "C" State, named Coorg State on 26th January, 1950 within Republic of India. Class "C" States were under direct rule of Central Government. Cheppudira Muthana Poonacha was the first and last Chief Minister of Coorg State from 1950 till 1956. 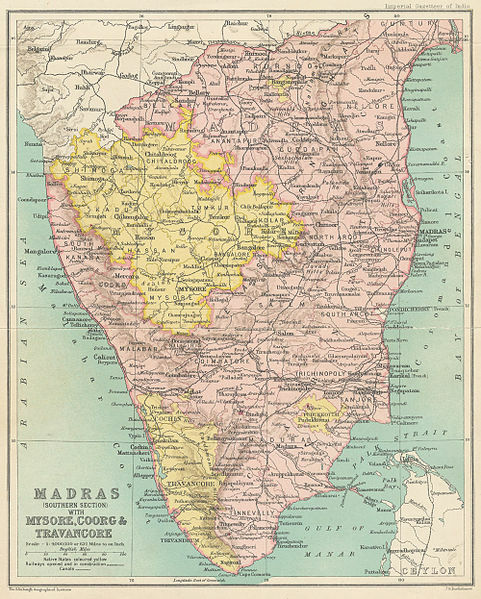 In 1956, when India's state boundaries were reorganized, it became a district of the then Mysore StateMysore State was later renamed as Karnataka, as the historical region of Coorg, now forms the part of Kodagu district of Karnataka.